is granted only to those who are prepared. PARIS: From the front lines of Iraq to more genteel spots like Harry’s Bar in Paris, the election of Barack Obama opened a floodgate for the world’s hope that a new U.S. leader would redeem promises of change, rewrite the political script and provide a kind of leadership that would erase the bitterness of the Bush years. As President Bush meets today with French President Nicolas Sarkozy and the head of the European Commission, he might keep in mind the view of the United States from Europe, Japan and elsewhere. By the time Suleyman Ergun was 21 years old, he was the world’s most prolific and powerful seller of smack. Known throughout the junkie and police communities as the North London Turk, Ergun and his gang flooded Britain and Europe with heroin for five years. For his pains, the former factory worker got mansions filled with cash and unlimited underworld cachet. At the height of his powers he was a multimillionaire and his favorite tipple was a bottle of champagne with eight grams of cocaine dumped into it. Today, he is almost penniless and lives with his mum. He’s 39. What happened? Most people have to shell out to give their homes a makeover – not so for these multi-coloured mollusks. The flashy snails have had their drab shells given a paint job for nothing – and they didn’t even have to move a muscle. 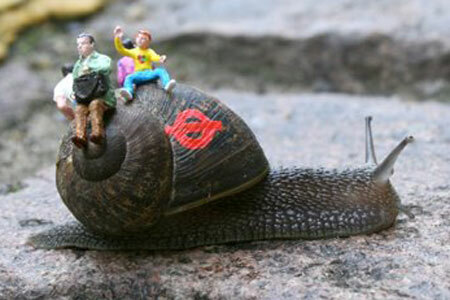 A London artist, known only as Slinkachu, has used the molluscs’ shells for a series of designs dubbed ‘Inner City Snail – a slow-moving street art project’. 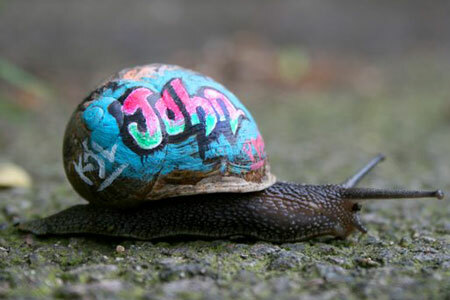 One was given a graffiti-style urban revamp complete with a new name – John – spelt out across its shell. Another had the Tube logo painted on as well as acquiring a couple of unexpected passengers. 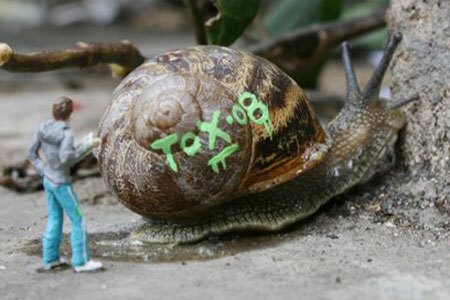 Slinkachu was keen to point out that non-toxic paints were used. And, with their long lifespan, don’t be too surprised to see a brightly-coloured snail making its way down a street near you. In a previous project, Little People, Slinkachu photographed tiny plastic figures apparently going about their lives in the capital, from Tube travel to sightseeing. He left many of the figures dotted around the capital for their larger, human equivalents to discover. See http://www.innercitysnail.blogspot.com for more images. You are currently browsing the archives for the Europe category.